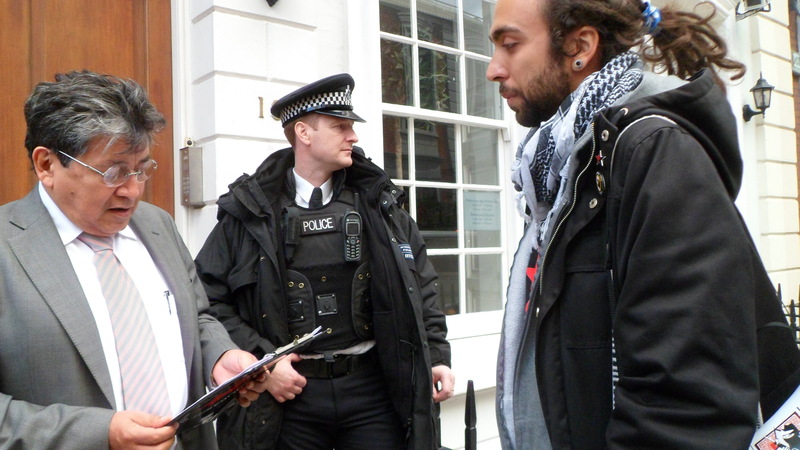 London responds to the call “Worldwide echo in support of the Zapatistas”. From October 12th to November the 17th, 22 countries around the world manifest their support to the continuous attacks and repression that Zapatista Support Bases in Chiapas (BAZ) have endured ever since they became autonomous from the Mexican state, with an emphasis on the most recent acts of violence and displacement that paramilitary groups complicit of the state such as “Peace and Justice” and the Regional Coffee Growers Organization of Ocosingo (Orcao) exert invading, repressing, and using violence over Zapatista communities. Yesterday 2nd of November, Mexicans celebrated the traditional “Dia de muertos”, an occasion where Mexicans gather to remember and dedicate time to their loved ones who’ve passed away, with the belief that their spirits, in their journey to the other world, pass and join us in this special day . Hence, in remembrance with our indigenous (or Nican Tlaca) brothers and sisters who have died either indirectly due to global the neo-liberal system of dispossession, exploitation and neglect, or directly via repression from the Mexican military and state-funded paramilitary, Yosoy132 Londres gathered in co-ordination with the Essex Zapatista Solidarity Group and the indigenista organization Tawantinsuyu Nation at 16 George street (where the Mexican embassy is located) to send our message. A message that joins voices with the Zapatistas and countries all around the world to remind the neo-liberal system and the Mexican government system of repression that the Zapatistas are not alone, that we are fighting them too and that the success of the Zapatistas won’t be diminished. Differently from other protests at the embassy, this one had 6 police men blocking the entrance and a van just across the street despite the relatively small size of the contingent. “Zapata vive, la lucha sigue” and “El pueblo unido jamás será vencido” slogans were shouted as well as a pronouncement in solidarity with the Zapatistas to put in evidence the Mexican state and the complicity of international so called “democracies”. 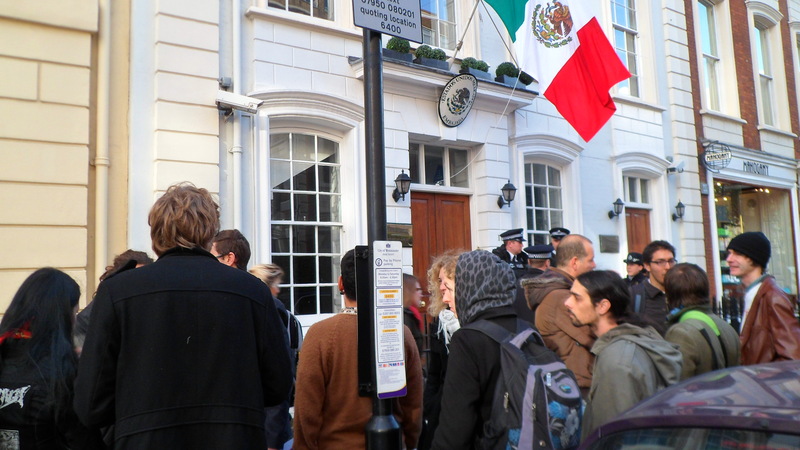 The Mexican ambassador squeezed quickly out of the embassy before the protesters started shouting and sent someone else instead who to the surprise of everyone, got out of the embassy to receive them before they even knocked the door to hand in the petition. The Zapatista Army of National Liberation (EZLN) or Zapatistas established themselves by declaring war to the Mexican government in 1994, in response to the declaration that Mexico was to sign the North American Free Trade Agreement (NAFTA). It started attacking military posts, seizedvarious municipalities of Chiapas including the important city of San Cristobal de las Casas, and took hostage who was then the repressive governor of Chiapas. In response, 17,000 soldiers were sent to fight the insurgents. This treaty, which the PRI managed to convince many that it was the ‘antidote’ to Mexico’s economic problems, and that promised so much benefits to Mexican nationals, has been one of the most damaging actions in recent history. Of course this applies, for those who were peasants, miners, maquiladora workers, the common workers and even the middle class in Mexico, for those at the top has been but the opposite. The gap between rich and poor has widened at an unprecedented rate. Tomato, coffee, corn, beans and other staples production has fallen so much that Mexico is not anymore self sufficient in food and today something like 34% of the corn consumed in the country (the most important staple in the Mexican diet) is imported. The US subsidies its farmers generously and heavily invests in efficient, engulfing production methods and then sells its products in Mexico below market price so that local producers can’t compete and get driven out of the market. Industries and big multinationals such as Wall-Mart and Gold Group freely enter the country, exploiting workers, taking the country’s natural resources, and leaving unprecedented lifestyle and environmental damage. They destroy industries, local markets and family business, causing mass migration to the US, where they (if they manage to get alive) often end up living in much worse conditions. However, this still forgets about the indigenous poor in Mexico, who live in a state that’s sub-human, a state of the underworld, or even more below that. They can’t even have the expectation of living bad, which could be the expectation of a poor worker or a poor peasant. Chiapas, despite of being one of the richest states in the country, half of the population has no freshwater to drink, and two-thirds have no sewage. 90% of the rural population of Chiapas earns scant or no income, education is the worse of the country, hundreds of children die of curable diseases, and despite this, when elections come, Chiapas is the state that has the largest vote reserve for the PRI. The party that ruled Mexico for 70 years and will start ruling again on December. Despite the initial YS132 focus was on the fight against the imposition of an illegitimate president and the blatant use of mass media to mislead the population, our stand in solidarity to the groups in resistance in Mexico such as Atenco, Cananea, the SME and the Zapatistas and other indigenous (or Nican Tlaca) groups in resistance, is clearly stated in our manifesto. This is why the movement participated yesterday with Essex Zapatista Solidarity Group and will continue to do so in similar actions, such as to oppose and make life impossible to the oncoming PRI rule in December. Miren lo que me encontr�!